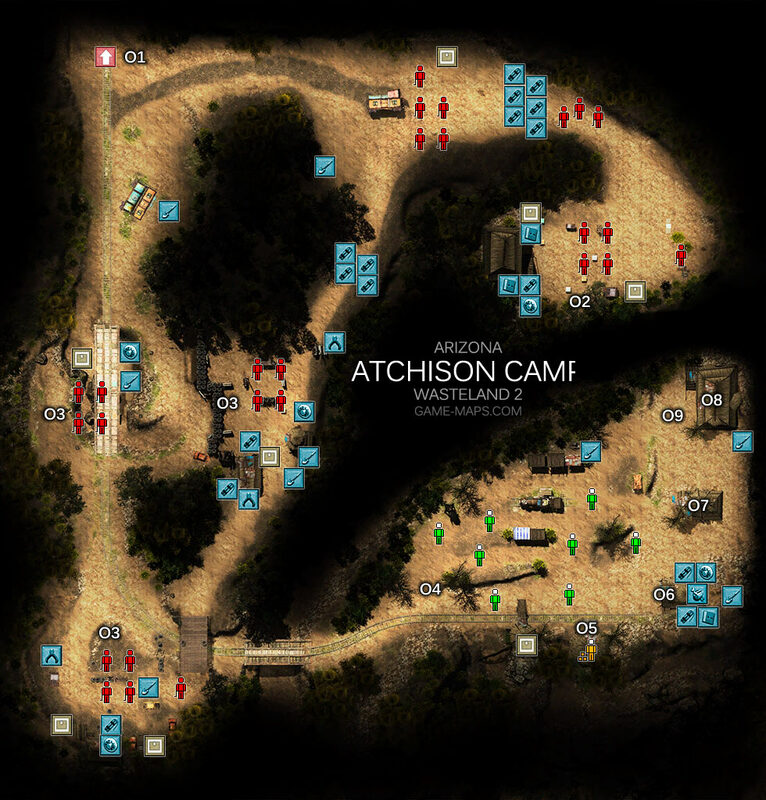 Atchison Camp Walkthrough - Wasteland 2 Video Game Walkthrough with Maps & Game Guide. Quests, NPCs, Items, Secrets & Hints, Enemies, Skills to Use. QuestRail Nomads CampRetrieve Mr. Holliday's stolen supplies from the junkies We recovered a crate of supplies marked "Mr. Holliday's Armageddon Emporium" from a gang of rail thieves. This must be the shipment Mr. Holliday mentioned had been stolen. QuestRail Nomads Camp Get rid of the rail thieves for Kekkahbah. We took out 3 bands of rail thieves. No evidence of additional gangs can be found. Kekkahbah will want to know about this. 04 Atchison Camp - This place looks like it's made out of matchsticks and broken dreams, and the people are as dull-eyed as starved dogs. Also, there are almost no men among them. It looks like the Atchisons are nearly all women. 05 This hut has a lot of junk sitting outside it, most of it so rusty that you can't tell what it once was. A sign over the door reads "Switchman Antiques." QuestRail Nomads CampLocate an ancient machine called a "CD-i." Found a CD- machinei. Wonder if it still works? ItemFertilizer Sprayer item from toaster. 08 A tough, leather-skinned man in his early forties. His angular face is framed by wild sideburns, and he has tattoos of railroad spikes on both forearms. His war paint makes it look like he's covered in soot. QuestRail Nomads Camp Find a way to resolve the Topekan/Atchison conflict Casey James has asked us to speak with Kekkahbah in order to secure the release of his daugther, Jessie. 09Brake Shoe is hidden in a seesaw in the Atchinson camp, just shot seesaw and pick it. However giving Brake Shoe to Kekkahbah is not part of the path that resolves the conflict.